With the advent of organic lawn care and gardening hand powered push lawn mowers are popular again, and they work better than they did in the good old days! 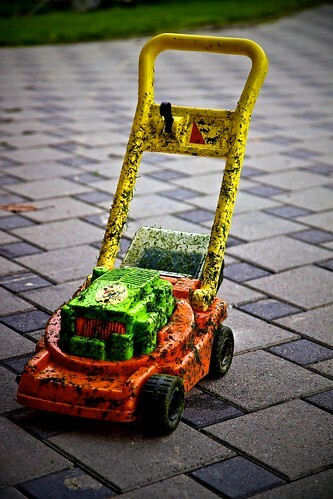 If you are considering buying a lawn mower, you have several options from which to choose. Each type of lawn mower has its advantages and disadvantages. It may be possible that you will want more than one because different situations call for different tools. These are the originals, and you can find some of them in antique stores. However, with the advent of organic lawn care and gardening, they are popular once again, and they work better than they did in the good old days. Push mowers are powered by elbow grease, which is a renewable source of energy. Other names for push mowers are reel mowers and cylinder mowers. These alternate names reference the cylinder inside the mower housing that holds the blades that cut the grass. When you push the mower and the wheels turn, they cause the reel to revolve so that it cuts the grass. It almost sounds like fun, doesn’t it? And it can be, as long as you keep the blades sharp and properly aligned. Dull blades will drive you nuts because it makes it hard to push the mower through the grass. Also, certain grasses are harder to cut than others. Thick, matted grasses can be tough; however, you can overcome this by raising the height of the mower blade. The benefits are many with a push lawn mower. Among other things, you will save money on gas, help the environment by having no toxic fuel emissions, produce no noise to disturb your neighbors, and throw no rocks or debris through windows or toward children. These are the most commonly used in the United States. They are convenient because the power of the engine makes it easier to push them over the grass and cut it, and they are simple to maneuver around the yard because there is no power cord to deal with as with an electric. On the other hand, a gas mower with a large engine can be quite heavy, which has the opposite effect on maneuverability. Gas lawn mowers do have some other drawbacks. For example, due to the burning of fuel, they emit pollutants into the environment. Furthermore, that fuel costs money, and it is costing more all of the time. Power mowers, especially gas guzzling ones are also noisy and do not win any friendship awards from your neighbors at 6 a.m. on a Saturday morning. If pushing a reel mower is not your thing, or if you are not physically able to operate a push mower, an electric mower is a great alternative, and it is a good organic lawn care tool. They are lighter and quieter than gas powered mowers. Many years ago, using an electric mower meant dragging a long extension cord around behind the mower, and the risk of running over it with the mower was high. You couldn’t relax and cut the lawn always making sure the cord was out of the way. Today, some electric mowers allow you to plug into an electrical outlet to charge a battery in the machine, and then when you are ready to mow, you can do so cord free. Electric mowers cost a little more than hand push mowers, and they are not as powerful as gas mowers, but they are definitely worth considering. Perhaps the only downfall is that you must remember to recharge the battery it before the next mowing is due. Some people like these because there are no grass clippings to worry about. Rake them up and compost? Leave on the lawn? The good thing is that the clippings get chopped up by the mower and left in the lawn and ultimately become fertilizer for the grass. Clippings provide a lot of nitrogen, which makes the grass green. The part you have to watch out for is the potential for thatch. If you are nitrogen fertilizing and/or watering excessively you are forcing the grass to grow quickly and you can end up with lots of grass clippings. Excessive nitrogen from too many grass clippings can by itself cause your lawn to grow too quickly. What happens is that these excessive amount of clippings don’t break down quickly enough and can compact between the soil and the blades of grass and create thatch. Additionally, too much grass clipping mulch in the lawn can create an environment that allows harmful insects and fungus to thrive and breed. If you have a fast growing lawn you may be better off collecting the clippings and putting them in your compost bin. You can use a lawn sweeper to do that. Use your common sense about this! You have some good choices when it comes to mowers. You will have to determine what is most important to you: If it is economy and the environment, the manual push mower and the electric lawn mowers are the winners. If it is power, the gas mower might be for you. If you hate raking or emptying a grass catcher, try a mulching lawn mower. Maybe the best lawn mower is the person who shows up every week to mow your lawn for you.